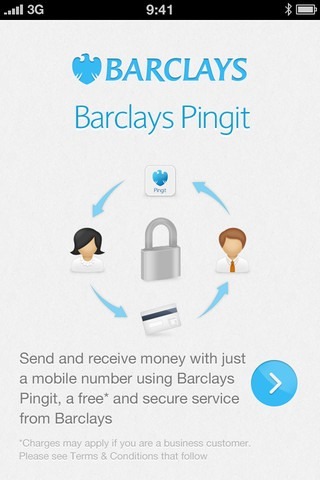 Barclays Pingit App for iPhone lets you send money using just a mobile number. Barclays Pingit is an easy way to send and receive money using your UK mobile phone. The app is free to download and use*, payments are secure and it takes seconds for money to arrive. If you have a Barclays current account, you can use the Barclays Pingit app to send and receive money. If you bank elsewhere, you can register online at www.barclays.co.uk/pingit to receive payments. Soon anyone with a UK current account will be able to use the app to send money too, subject to meeting the criteria below. You can send up to £300 a day to family, friends and small businesses using just a mobile number, as long as you have a UK Barclays current account. Soon everybody will be able to use Barclays Pingit to send money even if their current account is with another UK bank. Anyone with a UK current account can register to receive payments, so you don't have to share your bank details when asking someone to send you money. If you don't have a Barclays current account or simply want to receive payments from other Barclays Pingit users, you just need to register online at www.barclays.co.uk/pingit. The Barclays Pingit app also lets you find your nearest Barclays ATM or branch and, if you're a Barclays current account customer, you can view the balance of your linked account. You can download the Barclays Pingit app from the UK App Store.